Indian weddings often require a great deal of planning and preparation. It is an elaborate ordeal, with a lot of detail and thought put into every step of the way. The invitations are a key part of every wedding and Indian wedding cards reflect the splendor of the ceremony by incorporating religious symbols, intricate designs, and bright colors. 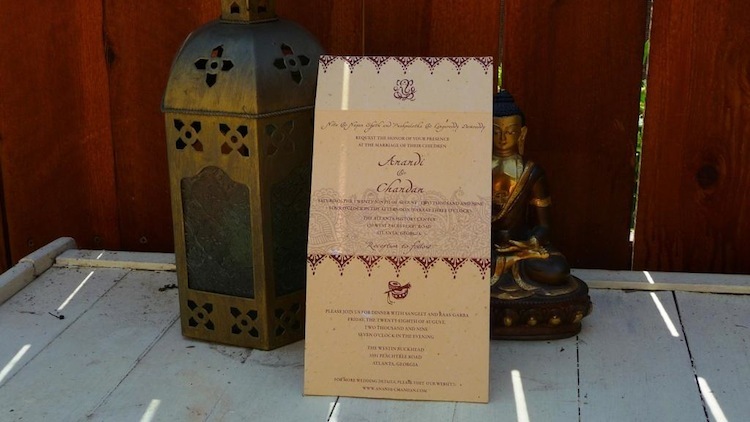 Contemporary styles blended with traditional Indian artistry, like Henna and Mehndi patterns, create beautiful invitations that can be used in any Indian wedding, and works especially well when the couple being married are from different cultures. Our Indian Smile wedding suite includes everything you could possibly need for a big wedding celebration. First Save the Date with our unique cards then prepare the perfect invitations! Be sure to send out insert cards to include any fun details such as lodging information, directions, or anything your heart desires. Don't forget the matching RSVP cards so you know exactly how many guests you will have and plan accordingly. Provide elegant programs, informing your guests of every detail of your ceremony. The reception is almost as important as the ceremony and your friends and family will be excited to celebrate with you, dancing, drinking and smiling! We have menus and table cards to match your invitations and bring your wedding suite full circle. When all is said and done you can use our unique plantable thank you cards to show your gratitude and appreciation to all your guests that helped make your wedding day so special. Invite them to plant the thank you cards and grow beautiful wildflowers in remembrance of your new life together with your spouse. Charming and intricate, the Indian Smile wedding suite features flowers, vines and leaves entangled to put a smile on your guests with its bright and warm design. The Hindu elephant deity named Ganesha is a very popular symbol among Indian themed invitations. Also spelled Ganesh and Ganesa, it is the Lord of Success. We have created a beautiful and unique invitation using our purple chalk 100% recycled paper. This invite features a gold Ganesh sitting high atop, blessing you and your loved one. The golden border adds a flair of elegance and royalty. This is truly a great invitation for a formal and royal celebration. 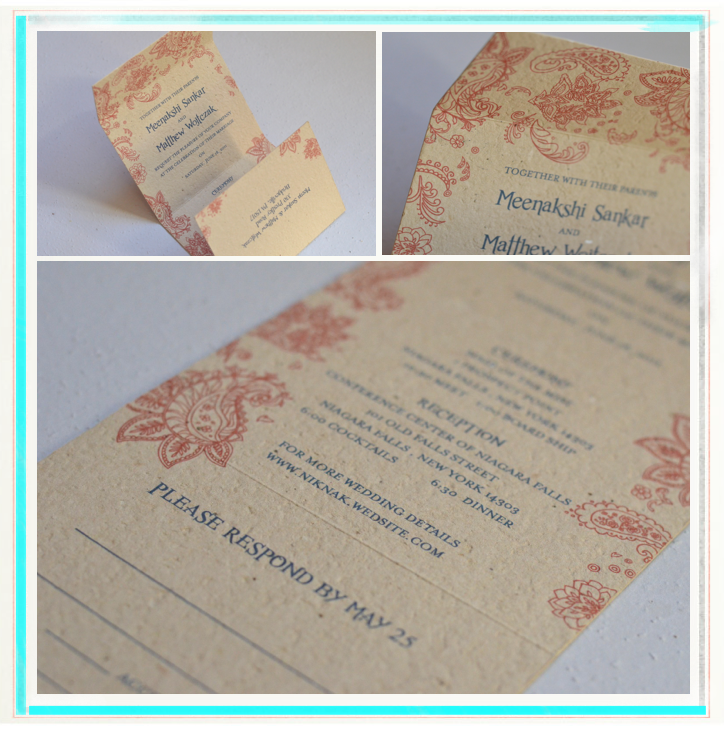 As with all of our invitations, you can add printing on the back with custom text (displayed below). We also have a matching wedding menu on our purple chalk recycled paper! Another unique and color invitation for your Indian wedding, Vintage Damask! Elegant with a floral design, this classic wedding invitation will honor your friends and family. It combines the popular damask style pattern with a vintage frame. 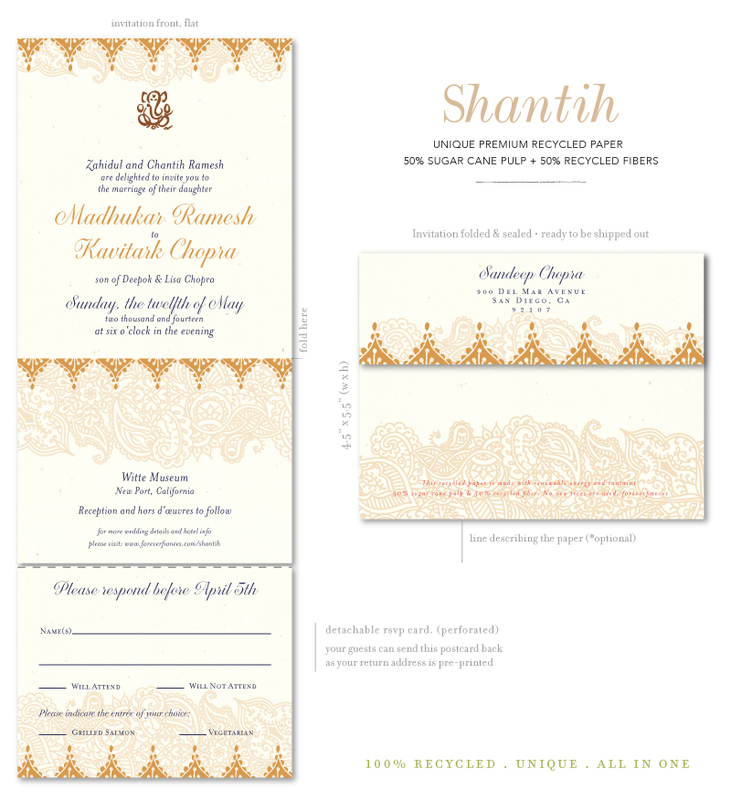 Top it off with a symbol of Ganesha and it becomes a chic Indian wedding invitation. 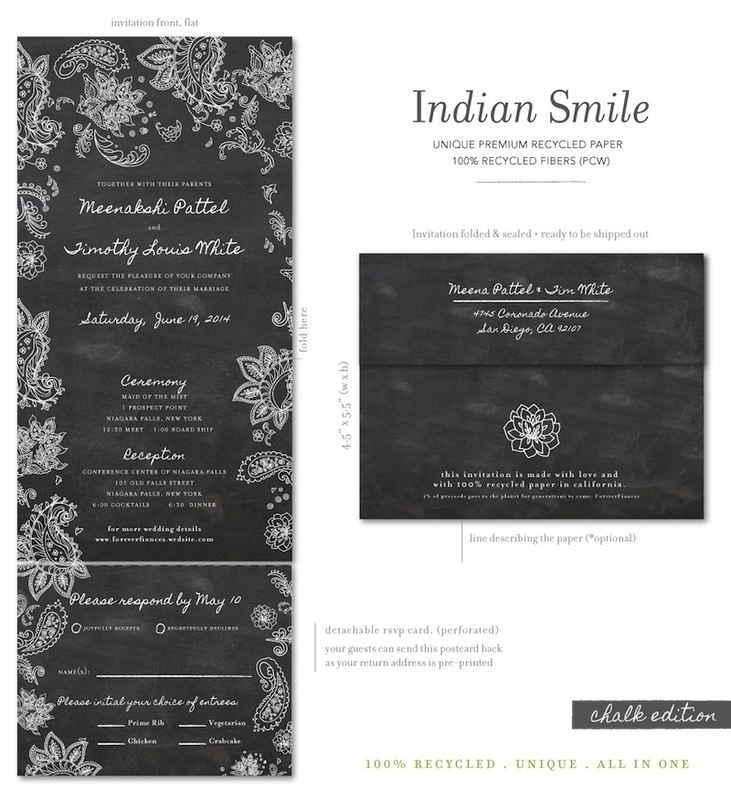 The Ganesh symbol is optional because our invitations are customizable, just for you to match your style. Shantih is a Hindu word meaning "Peace." Tranquility, calmness and bliss are other interpretations and we have created a beautiful wedding suite to represent this feeling. Dazzling in it's originality, this design will have your guests entranced by its mesmerizing exotic warmth. Fill your upcoming nuptials with these bright and bold invitations, sharing the Indian tradition. The intricate henna style artwork is shaped by the lovely border to evoke that feeling of peace and serenity. With our classic format and our unique Send n Seal format, we have an invitation you will love for your Indian wedding. We also have matching response cards available. Henna Flower is a popular wedding suite that was inspired by Mehndi. Henna or Mehndi is paste that is applied to skin as a temporary form of artwork practiced mainly in India. It is an Indian tradition normally applied during weddings and and festivals. Often brides will host a Mehndi celebration on the eve of their marriage to decorate hands and feet. Delicate and intricate, like the mehndi and henna patterns themselves, with a beautiful floral design, this unique wedding invitation will be a hit with your friends and family. Perfect for an Indian wedding or just those of you getting married that love flowers. Along with invitations we also have insert cards, seed paper favors, table cards and thank you cards. The word Sari means 'strip of cloth.' It is a popular garment for Indian weddings that females wear, consisting of a drape wrapped around the waist, with one end draped over the shoulder. The sari is symbol associated with grace, suiting for a wedding. As brides are gracious and beautiful, a sari will accentuate the beauty within and out. 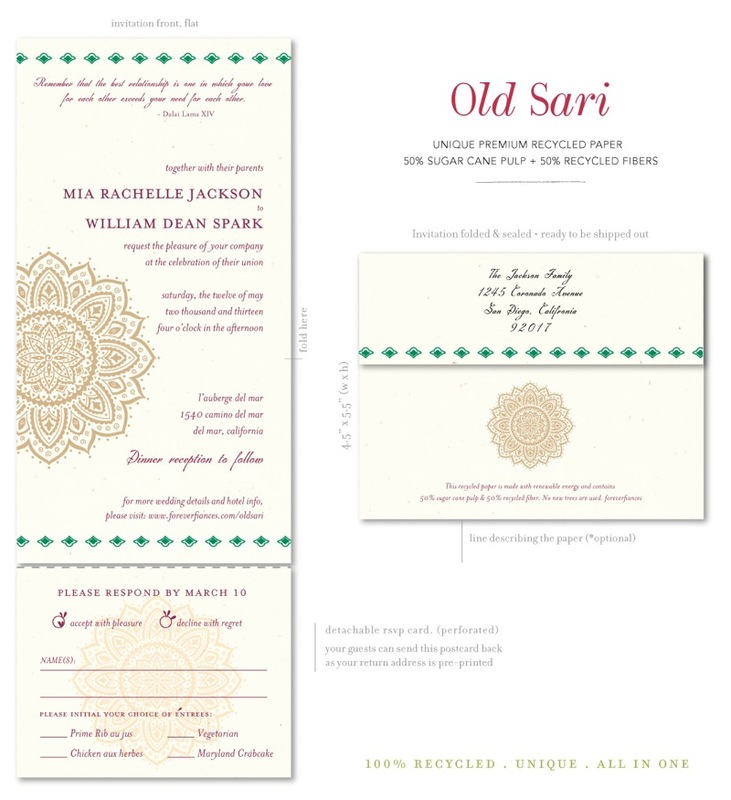 Inspired by these gorgeous Indian traditional garments our Old Sari invitations feature beautiful color combinations and an intricate floral motif. Dress up your reception with matching table cards! Perfect keepsakes for your Indian wedding. Wow your guests with our Mehndi Holi invitations. Whether you want to use them to invite guests to your Mehndi ceremony before your wedding or use this delicate, floral inspired design as your wedding invitations, they will go perfectly with your Indian celebration. Choose your own colors and and custom text to make these invites your very own. They are available on our colorful selection of plantable papers, embedded with wildflower seeds, or our 100% recycled papers. There are so many color combination possibilities you will have a difficult time selecting your favorite one! We will start by posting 4 of our full colored recycled paper invitations, printed on our double thick, premium matte (130 lbs) paper. These invitations are eco-chic with a timeless, simple and sweet design. Colorful and classic, Sacred Colors is perfect for an Indian themed wedding. These invitations are also available on our unique plantable paper, embedded with wildflower seeds. Complete your ultimate wedding suite with insert cards, table cards and thank you notes. Flowers go hand in hand with any wedding! 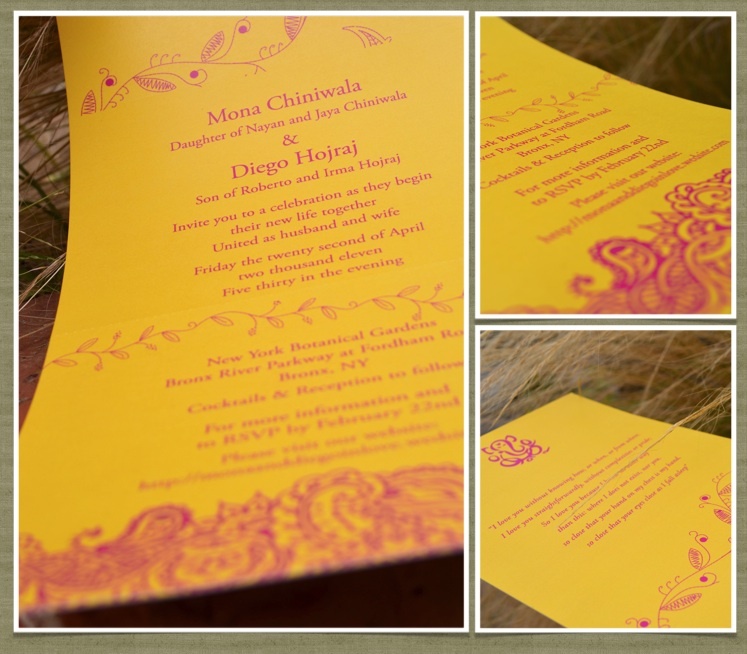 Flourish in the sun with these invitations for your Indian wedding. Gorgeous and bright, the Indian Flowers collection combines beautiful flowers and intricate detail that your guests will fall in love with. A typically wedding theme, with an Indian touch, our designers we're inspired to bring two popular motifs together! Choose your own colors to create a glorious wedding invitation or stick with our beautiful Darjeeling Purple. Paisley is the term for a design that resembles a twisted teardrop or a kidney-shaped motif that is originally from an Indian or Persian origin. It is very popular with quilts and silk fabrics. We converted the pattern into a delicate wedding invitation that allows you to keep Indian tradition while celebrating your wedding day. Here are two examples of our seeded paper invitations you can plant and a matching thank you card! Our Vintage Hindu collection takes a fancy circular frame and surrounds your custom text to create a gorgeous invitation. Adding some artistic flair around the outside of the frame, the card takes on a vintage touch. Elegant with a beautiful floral design, this classic wedding invitation will honor your friends and family. The detail is astounding, as the pattern is symmetrical and uses whimsical spirals, leaves, and flowers. We designed the matching program with the same outer pattern, we just removed the circular frame. The programs make a perfect keepsake for your guests. 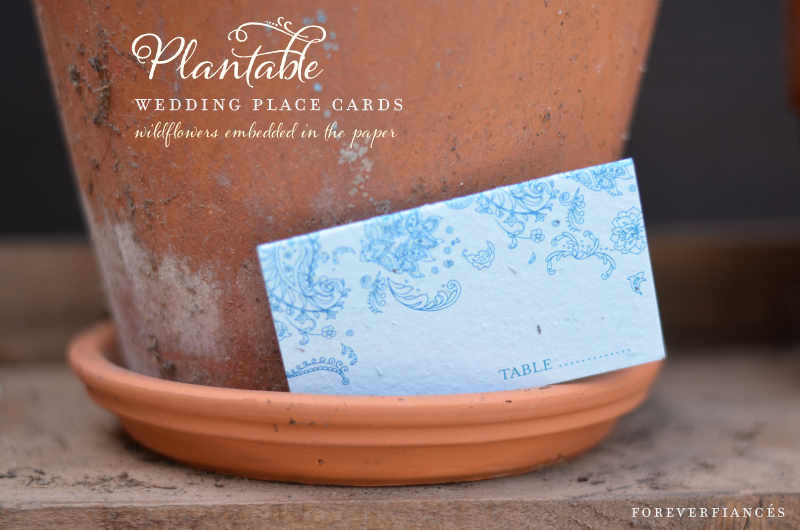 Invite them to plant the seeded paper cards and grow their own flowers to continue your wedding celebration. Raas Garba is a night of fun and energetic dancing and music that takes place prior to the wedding ceremony. Don't worry, even if you are not Indian you can still participate in this fun celebration! Everyone is invited. And you'll get the hang of it, because luckily the steps repeat. It is a casual, pre-wedding celebration to honor the bride and groom. Raas Garbas tend to have a carnival atmosphere with children running around playfully, loud music and traditional folk dancing. Go ahead and impress your guests with the Raas Garba wedding invitations. You can customize the text to use them for your Raas Garba celebration or the actual wedding ceremony. If you are doing both, then make matching invitations! This sweet Indian design filled with lovely flowers and vines is perfect for an elegant and cherished wedding or Raas Garba dance extravaganza! Mumbai, also known as Bombay, is the most populous city in India. It is also the wealthiest city in India. Vibrant, mysterious and full of charm, with a classic Indian style, this Indian wedding suite offers a unique way to give your guests a colorful eco-chic feel. This wedding suite offers Send n Seal invitations, classic invitations, programs and insert cards. Keeping with our Henna style artwork, the detailed pattern is intricate and beautiful. Juicy Mango and Orchid colors are popular choices but you are welcome to choose your own custom colors. Darjeeling is an Indian town in West Bengal. It is known for its tea industry, by creating new techniques for fermenting black tea. Sip some tea and get ready for another colorful wedding suite! Brighten up your Indian wedding with this warm invitation displaying unique stars intertwined with delicately crafted designs. The edges of the stars resemble flower petals, making them romantic and contemporary. Matching insert cards provide an excellent way to announce your Raas-Garba dance or Mehndi ceremony. Elephants are a popular symbol in Indian culture. They appear in various religious traditions and mythologies. Often revered as deities, they symbolize wisdom, royal power, and strength. As mentioned earlier, Ganesh or Ganesha is the Hindu god that represents wisdom. Elephants are worshiped because of their traits similar to that of a perfect disciple. They have small eyes and large ears. Disciples must use the eyes of the spirit, not the physical eyes and listen more than they speak. Elephants are obedient creatures, while remaining calm and and careful. Again, more examples of a perfect disciple. We have taken this popular symbol and decorated an elephant as if it were painted with Henna to create another beautiful invitation for an Indian wedding. Wisdom, power and strength are symbolized in this invitation to bring your friends and family together for one of the most important days of your life. Top 5 Trends for Bat Mitzvah Invitations!